Regardless of codes, you do not want the cold air returns in the garage to go back into the house. This makes use of the heat ducts problematic. You would have to let the warm air into the garage and go out an exterior vent. That's great for ventilation, but you then need to take in more makeup air on the house side. That's grat for ventilation, too, but you are paying more for heat. How about a heat exchanger? You have one side of the heat exchanger connected into the house system and the other side into the garage system. No air exchange at all between house and garage. Or forget the whole thing and use an Empire through-the-wall to heat the garage. No air exchange there, either. I use one on my detached shop, and I would do the same on an attached shop. Agreed...it's gonna look nice dude. I wish it would be an Evora! For now I guess I'm just going to leave it disconnected. I got in the attic the other day to fix the cable and all they did was squeeze the ducting close and hold it closed with a zip tie. Can't wait to paint and get 'em up! Paint shall begin this weekend! So then I can get to decorating with posters and banners and such. Speaking of banners, look what I found. Fenney's Flags, Banners & Signs - Search Results for "lotus"
I own an HVAC company and as stated it is illegal as well as dangerous for you and your family to run any ducts into the garage. 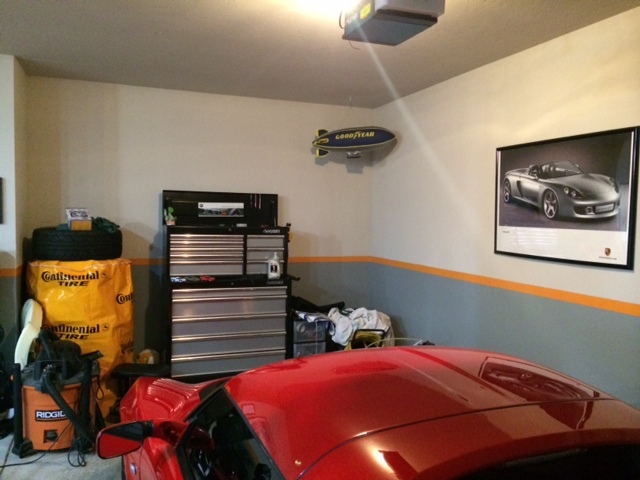 You NEED a separate system for your garage, look at a ductless mini split which is what I will use for my garage. Just read the rest of the posts, all they did was zip tie the vents shut? Wow! You have a bad home inspector, if any of my crew found that we would red tag(shut down the furnace) immediately because it would be a liability for my company since we found a potentially fatal issue and did nothing about it. Maybe I am just paranoid, but when a competitor was surd for millions over something like his after killing a family and when my fathers friend had a son that had carbon monoxide poisoning due to a faulty HVAC install that my company found you will know why I am so against these ideas that others are saying. You add air to the garage now your garage has a positive pressure and the house a negative, some air from the house will make it back in. Last edited by Korntera; 02-22-2014 at 06:43 PM. Its ok, its not hooked up and will stay that way. I'm going to start with insulating the garage door to help with temperatures. Check into mini-split systems for heat and AC. A lot more affordable and pretty easy to install. They do a great job of heating up large open spaces. Got the paint done. Now to the banners and posters. Used a laser level to keep the lines straight. 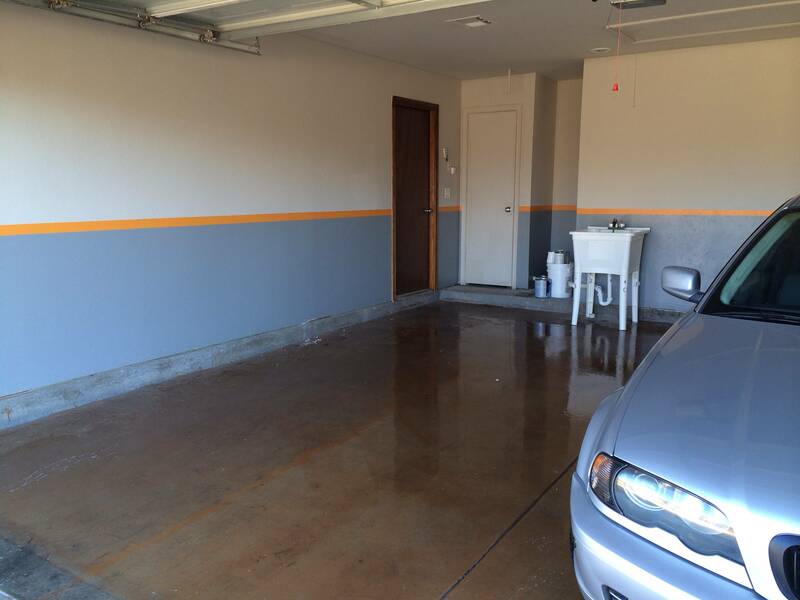 The floor was stained the dark red before we moved in because the garage used to be the office. I will eventually be getting it redone. The floor doesn't really match the walls yet! You can also see my garage sink I added since the garage was already plummed for a sink. Paint looks great. I am starting on new one (house in escrow now) and looking for inspiration. Where did you get the laser light thing? I was thinking of just doing blue tape for the middle separation line... is that a bad idea? I actually borrowed the laser level from my dad. It's just a craftsman laser level. I don't think blue tape for the middle line would end up working out in the long run. It will probably end up peeling and won't look as good as paint anyway. The orange line barely took much paint. 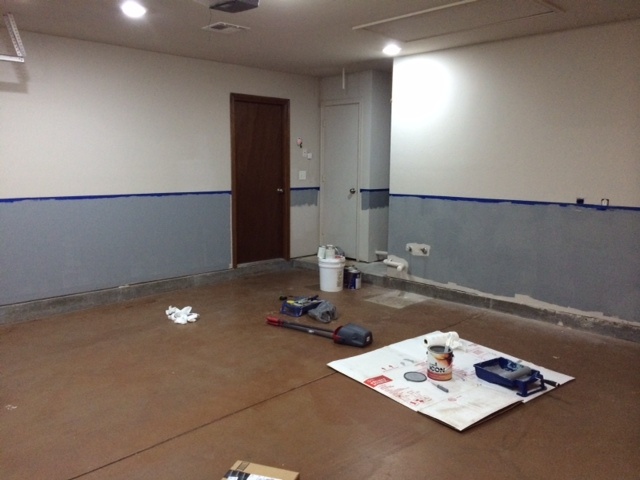 I am getting close to having the walls done, I will post pics soon. Oh I meant, since I don't have a fancy laser thing, if I can use blue painter tape to mask a line, and whether line would be straight. Then I can paint that line to separate the top and bottom color. That is actually how I started doing it, I found out my dad had a laser level and ended up finishing it with that. I just used it to make sure the line was straight. 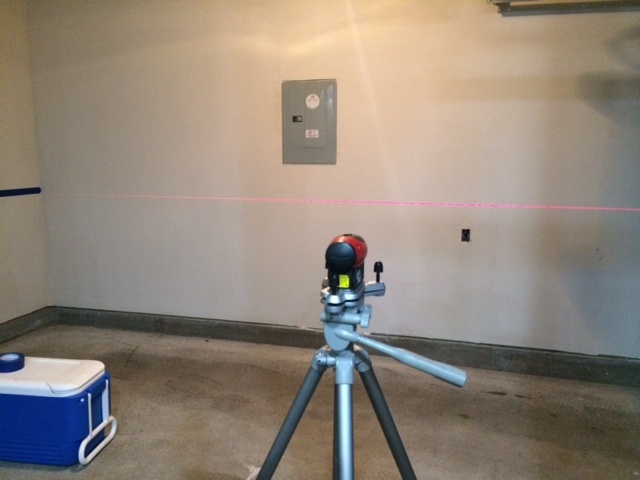 All I did was measure from the bottom of the drywall up a certain length and marked it every 12 inches and just used that as a guide for the tape. 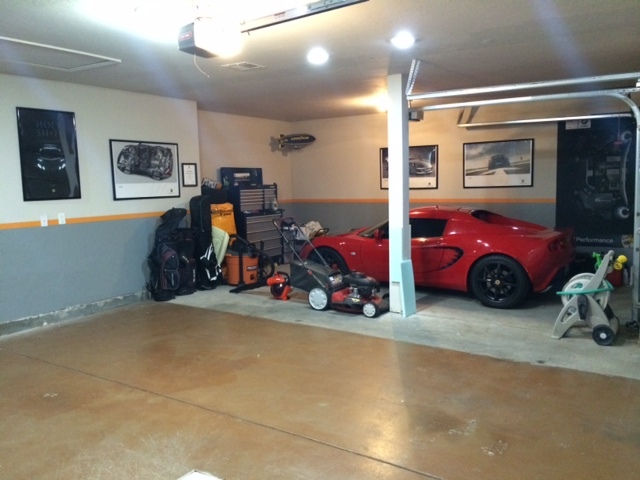 I've added some stuff to the garage. 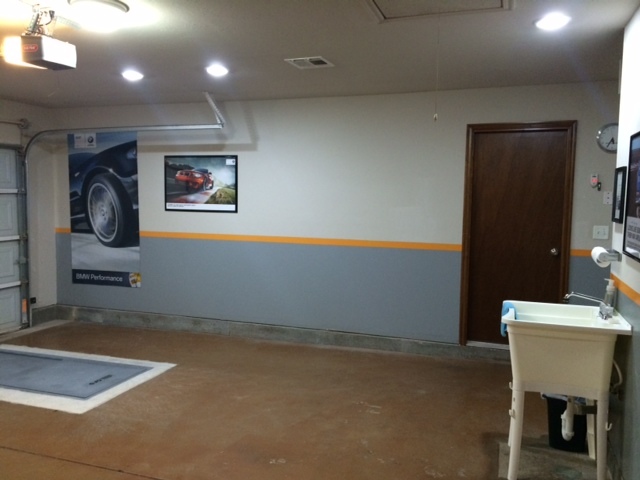 Still have to add a couple of posters in the blank spots, and add some more lighting in the 3rd car space. I need to buy a shed to put out back so I can get the yard equipment out of the garage. doge - Is that a stain on your floor? Looks good! 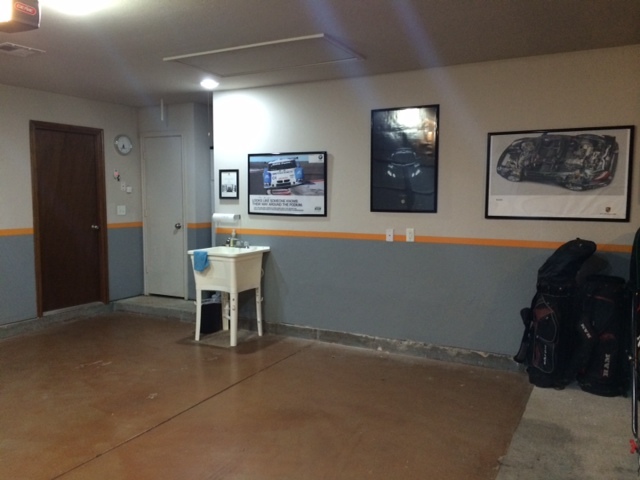 Our house used to be the "show home" for our neighborhood, so the 2 car portion of our garage used to be the office. So the floor was stained.